One of the things we in the first world got accustomed to is the availablilty of products. Sstrawberries in winter. Roses around the year. As a garden enthusiast (though for quite some time now one without a garden) or better a plant enthusiast I love the seasons. And things are more precious when they are only available for a short time. I don’t love winter. Winter comes with the rest of the seasons in a set. A bit like a gatecrashing guest. But that makes spring all the lovelier. I love the white carpet of the anemone nemorosa in our beech woods, the lush pink Japanese cherry blossoms, green leaves in general. The scents of a hyacinth field. 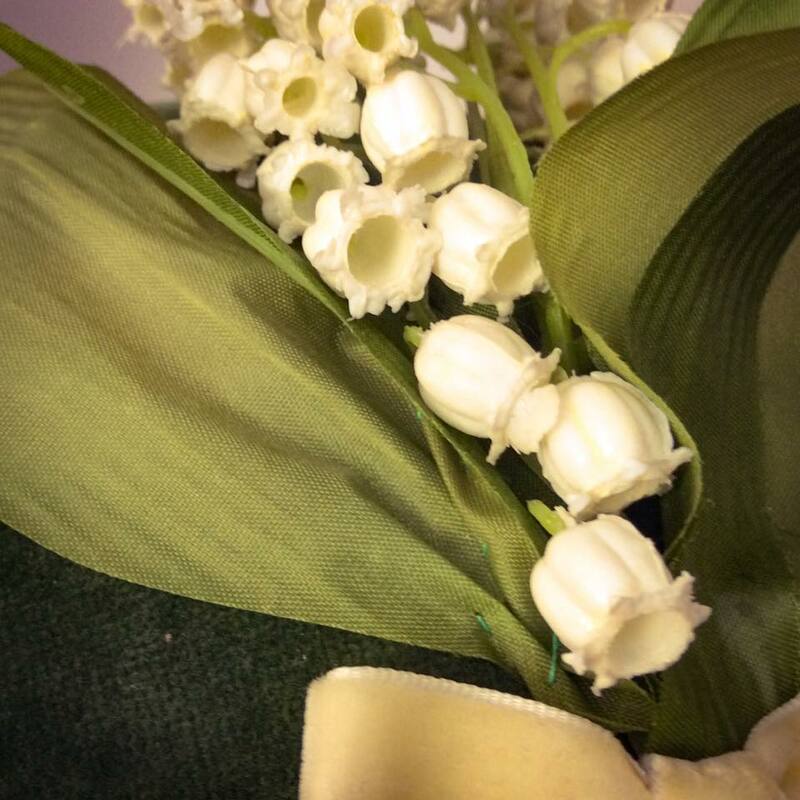 The dainty lilies-of-the-valley. 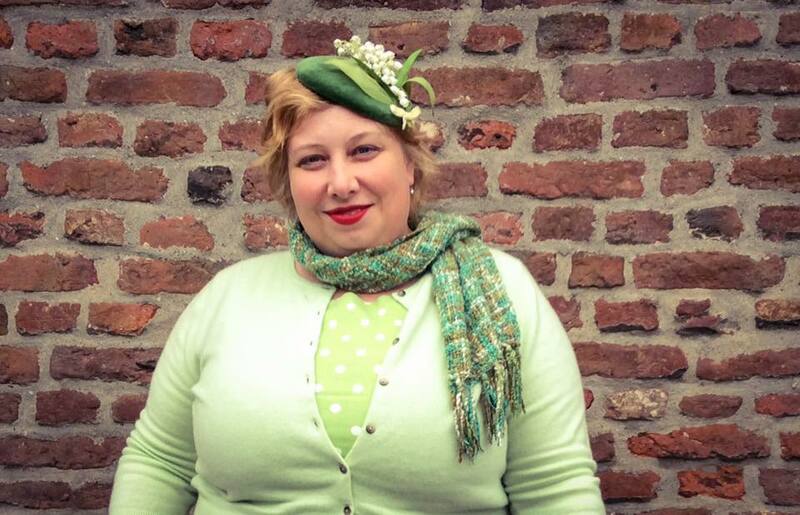 One of the hatmakers I admired for quite a while, Frollein von Sofa made this lovely ode to spring. Last week I showed it with darker tones. 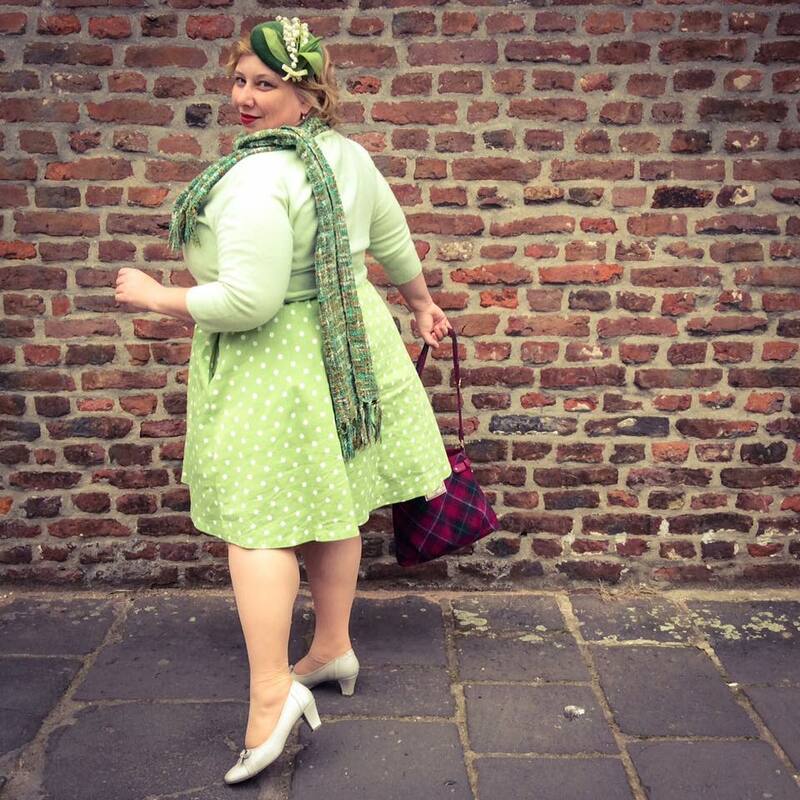 A highland fling in a wiggle dress. This time I paired my hat with much airier colours. 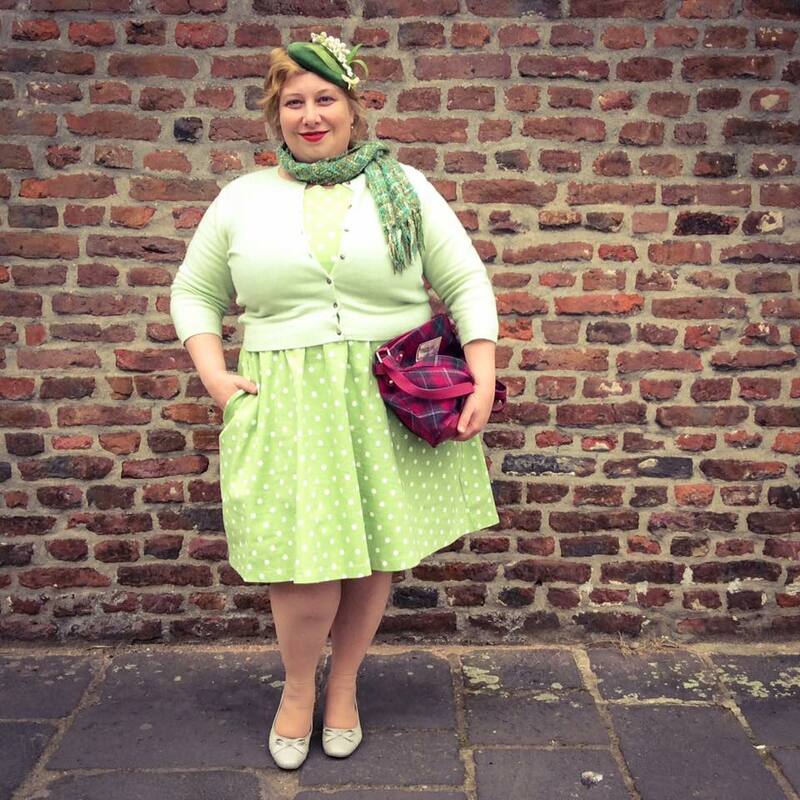 Light greens – a pale pea and a soft pistachio and a striking contrast with the pinkish tartan bag. The dress comes with pockets. And though I don’t love polka dots the way I used too I really like this one (and its white friend). 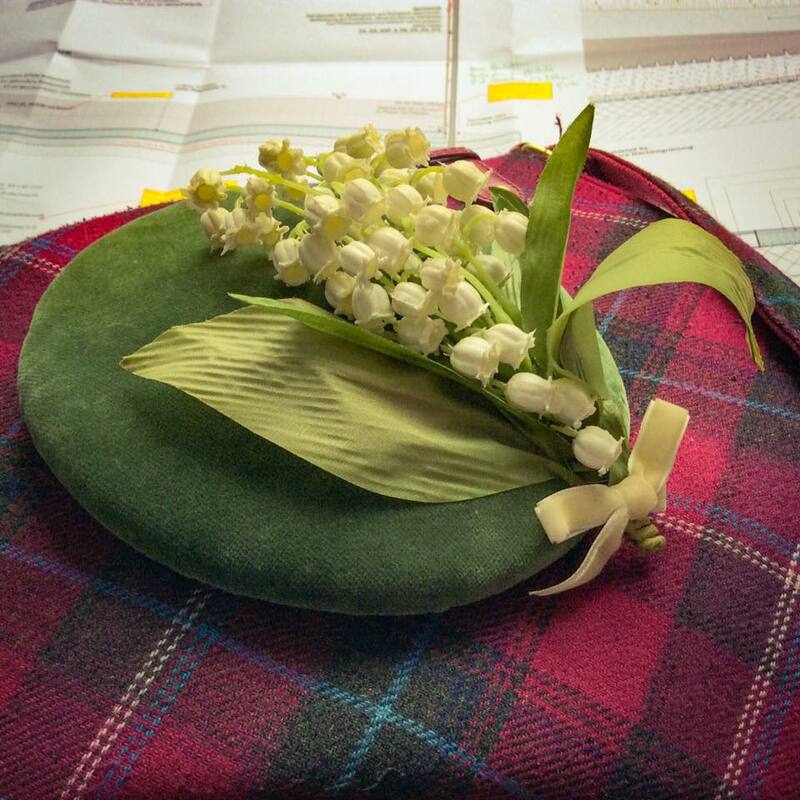 It is a spring dress, worn with a spring hat. I bought both last year. Last year I was on quite a bit of a shopping spree. Since the beginning of the year I keep a wardrobe diary so that I’ll keep track of the things I wear and how often I do so. Most of us have come across the tip to turn the hangers around once you have worn something. But for me that wasn’t enough. I wanted to know how much mileage my things get. I had to make a list first. And yes, I was surprised I have so many things. Dresses mainly. It is nice to have a lot of pretty frocks but it doesn’t really make you a happier person. Or more content. Though I don’t struggle with that. I love clothes. I come from a family of collectors. China, radios, clocks, art, books, plants. Or clothes, shoes, hats and other accessoires. But at some point it got a bit out of hand. So right now I try to focus. I got a lot of amazing things. But I want to give my things a bit more mileage. And I still have a few things you haven’t seen here on the blog yet. And yes – I have plans to buy a few things to add to my wardrobe. 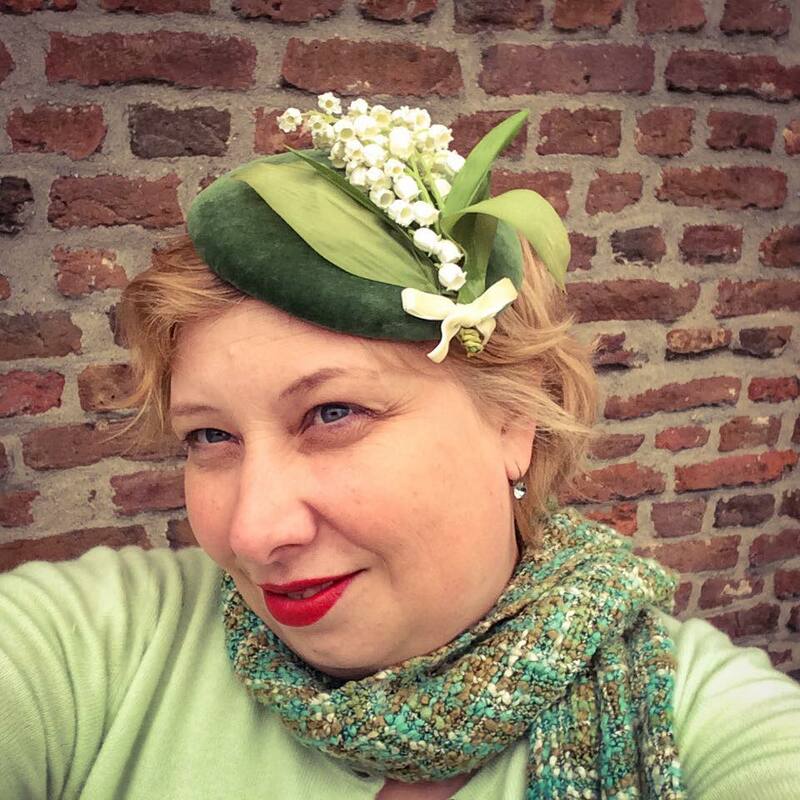 Dieser Eintrag wurde veröffentlicht in Hats, Spring von Miss Kittenheel. Permanenter Link des Eintrags. Hui, da kommt ja auch schon was von Dir, über das wie und warum du Deinen Konsum reduziert hast! Vielen Dank dafür. Und nebenbei bemerkt, mal wieder ein sehr hübsches FrühlingsOutfit! Liebe Kirsten – ja – wenn auch „nur“ auf Englisch. Ooooh! Zu diesem Kleid passt das Hütchen aber auch ganz wunderbar! 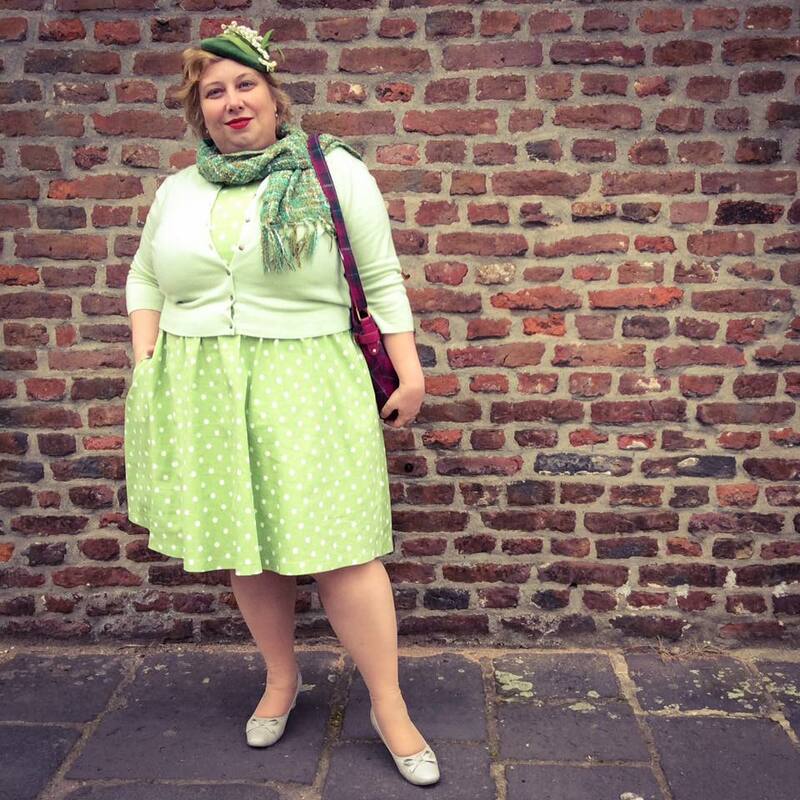 Ich bin ja so ein Grün-Fan und Polka-Dots lieb ich auch, deshalb gefällt mir das Kleid auch ganz besonders gut! 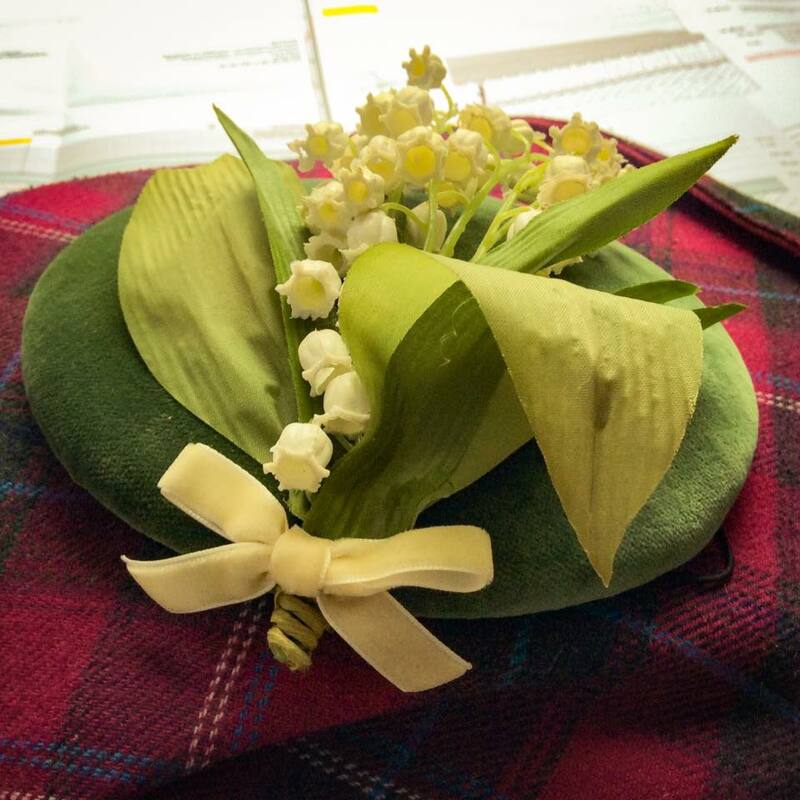 Und die kleinen weissen Tupfen bilden das Pendant zu den Maiglöckchen-Blüten am Hut, sehr, sehr hübsch! Die Tartan-Tasche als Farbklecks komplettiert das Ganze hervorragend!